Wetland Restoration: Wetlands provide food, protection from predators, and other vital habitat factors for our fish and wildlife species, including the California red-legged frog, California Tiger Salamander, and the Santa Cruz long-toed Salamander, as well as a variety of bird and terrestrial species. In addition, wetland have economic value associated with recreational and commercial uses, as well as scenic value. 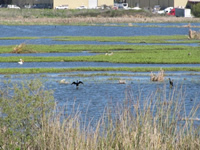 In addition, wetlands remove pollutants, increase groundwater recharge, and reduce flooding. Invasive Species Removal: Invasive species are non-native plants that are marked by their ability to spread easily and rapidly, such as English ivy, which grows over native trees, depriving them of sunlight. When a riparian tree is lost, critical nesting habitat for migrating birds, shade and food for fish in the stream, and bank stabilization is also lost. Invasive species outcompete native flora, degrading habitat and impairing ecosystem functions. Strategic removal with the appropriate methods, (ie. Hand pulling, herbicide application, goats, etc.) can improve riparian health, and wetland and upland habitats. 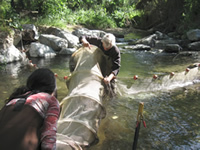 Removal of Fish Passage Barriers: Salmon and other migrating fish need access to freshwater habitat for spawning and rearing. In some cases, these fish need to swim thousands of miles through the oceans and rivers to reach their destination, but they are often blocked from completing their journey by man-made barriers, such as dams and culverts. These barriers can be replaced with full span bridges or other crossings and will hopefully lead to an increase in our fish populations, returning them to levels we haven’t seen in the last few decades but hope to see again. 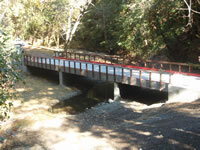 Fish Stream Improvement: Improvement of a stream channel to create new fish habitat or to enhance existing habitat for fish in degraded streams, channels, and ditches can provide shade, control sediment, and restore spawning and rearing habitat. 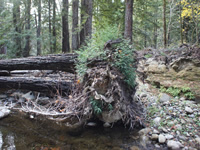 A number of activities can improve streams that have been modified in the past, such as strategic placement of logs, root wad, or natural rocks, re-alignment of a stream, reactivation of a floodplain, etc. 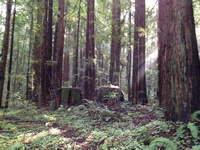 Upland Wildlife Habitat Management: Grasslands, redwoods, oak woodlands, and other upland habitats are extremely important shelter, cover, and food for a variety of our endemic species. Restoring and/or enhancingthese areas through revegetation can restore movement corridors and enhance foraging and nesting habitat. The installation of fencing and improving water distribution can facilitate controlled grazing that can reduce dense groundcover, encouraging the germination of desirable plant species. Sediment Managemen: Eroding streambanks or upland areas can contribute significant sediment to our streams, degrading riparian and wetland system functions. Erosion from these areas can also threaten houses and infrastructure and result in downstream flooding. There are a number of erosion control practices that can be used to protect homes, retain valuable property, and enhance habitat, such as streambank stabilization, gully restoration, and revegetation efforts. The RCD can provide other services relating to Species Recovery and Riparian Health.